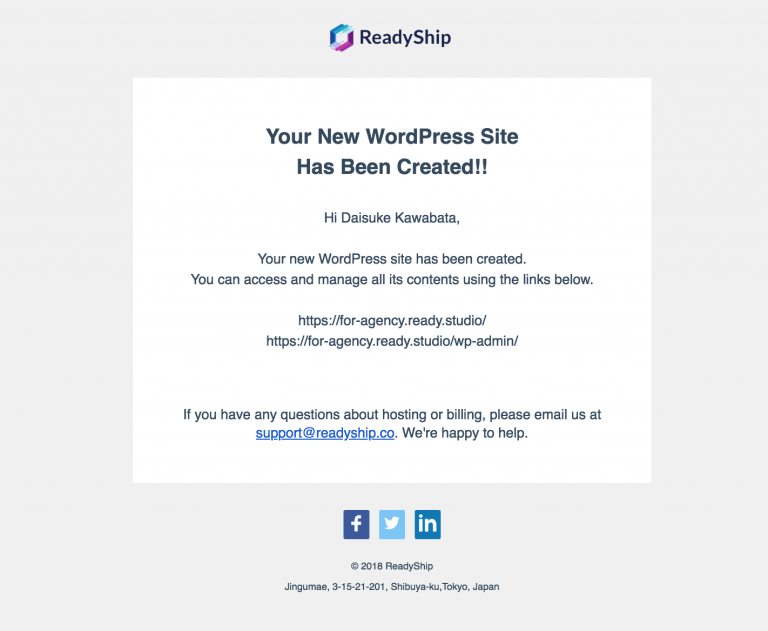 Launching your website with ReadyShip is incredibly easy! All you need to do is select a Ready-Made WordPress site that you like. The only information you have to input is your email address, password, and a domain name for your website. There is no need to input your payment information right away. The WordPress sites sold on ReadyShip are fully featured from the beginning, not only with themes, but also plugins, settings, customizations, design and content. Thus, you can launch a website for your business right away, simply by substituting the text and images with your own. Once you’ve found a WordPress site you like, you can launch your site right away. Our service includes a free 7 days trial period, so you can get a feel for how it works in actual use. First, select one of the three plans we offer: Small, Medium, or Large. Feel free to use one of the seven subdomains ReadyShip offers. If you want to use your original domain, you can set it up after the website is being launched. If you haven’t registered as a member yet, you can enter your name, email address and password on the same page. If you enter credit card information during the website launch process, you will get a bonus of 5 extra days on your trial period (for a total of 12 days). We also accept forms of payment other than credit card. For more details, please check Payments and Billing. A confirmation email will be sent to you. Please click the link to confirm your email address and login to your account. Once you login, you can setup a title and login information for your WordPress site and then click Start Building in order to launch your website. Once you click Start Building, the website provisioning will begin. The cloning will be complete in about 5-10 minutes, and once your website is ready for use, we will send you an email. Why does it take 10 minutes? Provisioning (the launching process of a website) takes time because of creating new OS image and WordPress site, cloning data and files, and setting up CDN. We’ll send an email once provisioning is complete. That’s it! Now you can login to your WordPress site and start editing! Once you have launched your website, you can use it at no charge for 7 days. If you enter payment information at the launch process, you will get a bonus of extra 5 days on your trial period, and you will be able to use your website for free for 12 days. If you want to continue using your website, please enter payment information in the control panel in your account prior to the end of the trial period. If you don’t enter payment information, after the trial period ends, you won’t be able to use your website. In this case, your website will be removed after a period of 21 days. If you don’t want to continue using your website, you can delete it from your control panel in your account. For more details, please check Cancellation. Limitations During the Free Trial Period: During the free trial period you will be unable to add/install new plugins or themes. Additionally, FTP accounts can only be made after the first payment has been received.